Oregon Beachcomber Blog - What's washing up? : Radioactive Tuna? As with any historic event, the Fukushima disaster created almost as much hype and disinformation as reliable information. Unfamiliarity with the process of radiation created panicked speculation regarding US food supplies, ocean contamination, and visions of glowing radioactive tuna inhabiting the Pacific Ocean. It is true that tuna are at the top of the food chain, and therefore act as 'bioconcentrators' of many marine contaminants- that is, they have the tendency to assimilate biotoxins (radiation, toxic substances, plastic derivatives) into their body tissues at a rate greater than it is metabolized or excreted back into the environment. This is especially an issue for top predators, as a small level of contaminants in one individual prey multiplies over time as many prey are consumed. When this begins at the very bottom of the food chain, the effects are even more amplified. 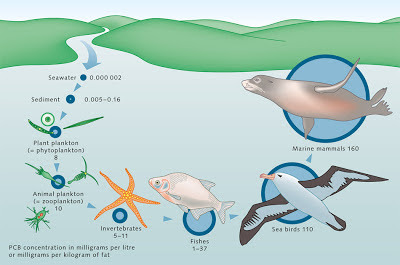 The effects of bioaccumulation have been studied for several types of plastic derivative, as well as heavy metals (mercury), and naturally occuring toxins, such as Domoic Acid, which is found in shellfish. The effects of radioactive bioaccumulation have also been studied as well, and in large amounts this could be an issue. (For more information on radiation, see my previous entry). In the months following the Fukishima event, scientists scrambled to decide whether or not this disaster would affect the world and US food supply. While tuna have tested positive for small amounts of radiation, the levels are certainly not that which would have any biological impacts. 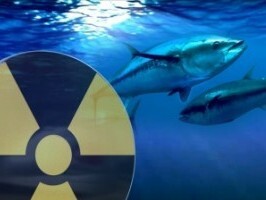 Scientists at Oregon State University have continued to test Pacific Albacore tuna for radiation, and have found that fish are radioactive far below any dangerous levels. Consuming highly radioactive food could have immediate health impacts, as well as long-term issues such as cancer, reproductive problems, organ damage, or blindness. However, the likelihood of mercury poisoning from consuming tuna is higher than experiencing any radioactive effects. The FDA recommends an average adult of 140-180 pounds (female and male, respectively) to eat no more than 4.4-5.6 ounces of albacore, or 12.8-16.4 ounces of white tuna a WEEK. This small amount of fish will have very little risk of radiation. Remember, radiation is everywhere in our environment- it is not the presence, but rather the concentration that is dangerous. Although the impacts on humans appear to be relatively nil, it is still unclear whether or not radiation will have impacts on the marine food chain itself. Studies are ongoing to determine whether radiation levels will result in decreased reproduction or survivability in marine animals. The results so far are unclear, as radiation is being found in almost all trophic levels, but in very small amounts. The effects, if they are tangible, will likely be long-term. The long and short of it is, this is certainly not the first, or most serious, marine pollutant. Incredibly harmful plastic derivatives, such as PCB (Polychlorinated bisphenyl) or BPA (bisphenyl-A) are being found to have wide-ranging environmental impacts. In addition, heavy metals such as mercury are human-caused pollutants that can have proven health impacts. Before we jump on any misinformed bandwagons, it is important to weigh information from reputable sources- scientific journals, university websites, the FDA, or your doctor. Certainly being cautious is not a bad thing, but if you love seafood (I certainly do), don't let fear take over your daily enjoyment of life. Examples like this are why you should always think before you swallow any news (especially 'Science News') that is presented by the general media (sorry, Oxynews). You can't blame them- there is always a competition for readership. However, it is very easy to get carried away and misinformed when reading about environmental news. News stations and websites often report on scientific findings, but even if they report them correctly, the fearful undertone can still show. "Officials caution that the levels detected are not life threatening." The simple composition of the sentence is misleading- the first two words insinuate that something serious has been found. Always read between the lines, and use your common sense when deciding whether a source is reputable. And certainly it never hurts to go back to the original scientific paper which is being spoken of. Then the next time your friends start discussing radioactive fish at the gym, you can say "Actually, there's more to that...."